My most popular post to date Online Shopping on a Budget: Sites Like Forever 21 focuses on more affordable choices for girls and women of all ages. But what happens when you are willing to splurge a little bit? I decided to get out of my frugal ways (still on a post-college grad budget), and explore some of my "wish" stores. Yes, the stores that I wish I can afford one day! It's fun to shop, but resisting the temptation to buy is difficult (though I did manage to find some good deals on adorable marked down clothes). 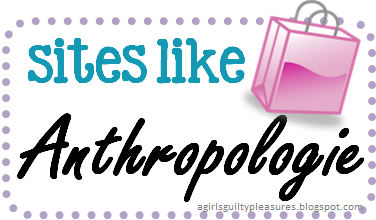 Here is a list of some sites like one of my favorite splurge stores, sites like Anthropologie! nice post for all type of girl it help in improving there business.. make popular on society.. see this sites to known about it.. thanks.. keep posting.. Thanks for such great info. I will pass this on to my girlfrens who still cannot work internet surfing. Yes I have 4 of them!!!!! I bought Tory Burch black boots from tradesy online shopping website and everyone loved it. it was my 1st experience with online shopping and now i really found it worth of doing.